Last week, we reported that director Antoine Fuqua and producer Jerry Bruckheimer are teaming up with Warner Bros. Television to produce a new TV series based on the 2001 crime drama Training Day. The producers were getting ready to pitch the project to all four major networks, and one week later, Variety reports that Training Day has found a home at CBS. Depending on how quickly the project moves forward, hopefully we'll hear soon about who will star in the pilot. The original Training Day movie starred Denzel Washington in his Oscar-winning role as LAPD detective Alonzo Harris, who spends a day with one of his new recruits, Jake Hoyt (Ethan Hawke), on his first day as a narcotics officer. Despite Alonzo's exemplary arrest record, Jake learns quickly that Alonzo and the rest of his team are dirty cops. The series will be set 15 years after the events of the movie, but it isn't known if these new characters will have any ties to Alonzo Harris or Jake Hoyt. Will Beall (Gangster Squad) is writing the script, with Antoine Fuqua set to direct the pilot episode. The writer and director will also executive produce alongside Jerry Bruckheimer and Jonathan Littman, with KristieAnne Reed serving as co-executive producer. The original Training Day movie was written by David Ayer, who is currently filming Suicide Squad in Toronto, but it isn't known if he will be involved in the series quite yet. Will Beall was actually an LAPD detective himself before starting his writing career on the hit ABC series Castle. 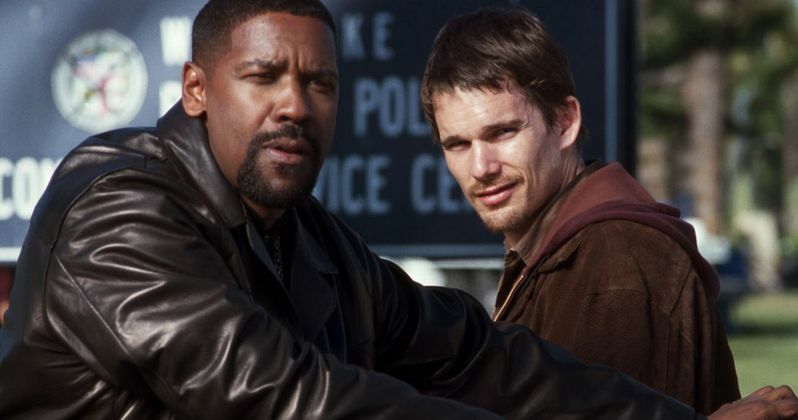 Related: Ethan Hawke to Return for Training Day TV Show? This certainly won't be the first movie-to-TV adaptation produced by CBS this year, with the network seemingly leading the charge in this category. CBS is debuting Limitless this fall, with Rush Hour coming in midseason. Limitless is actually produced by Bradley Cooper, who starred in the movie the show is based on. Fox also has Minority Report debuting this fall, with ABC's Uncle Buck arriving in midseason. We'll have to wait and see how long it takes for the pilot to come together, but it's possible this show could end up debuting next fall. If it does get a series order, the show would likely land in the 10 PM hour, reserved for darker, more gritty fare. The network is home to plenty of crime/police TV shows, but we don't know enough about Training Day yet to determine what show it could best be paired up with. What do you think about Training Day landing at CBS?